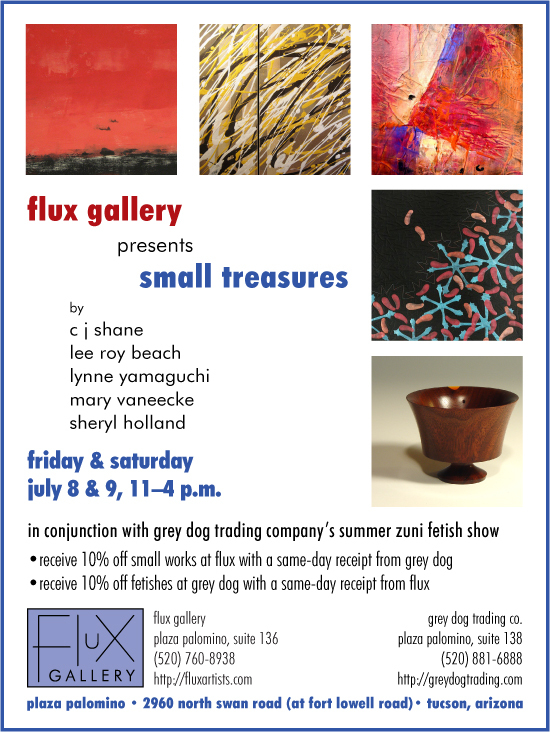 Next Friday and Saturday, July 8 and 9, Flux Gallery will feature small treasures by artists C J Shane, Lee Roy Beach, Mary Vaneecke, Sheryl Holland, and me. I will have several wonderful new small vessels and some new bottle stoppers. Our show will coincide with the summer Zuni fetish show at Grey Dog Trading Company, our neighbor at Plaza Palomino. Special for the show, we will offer a 10% discount on small works at Flux with a same-day receipt from Grey Dog; Grey Dog will reciprocate by offering 10% off of its Zuni fetishes with a same-day receipt from Flux. Flux will be open from 11 a.m. to 4 p.m.; Grey Dog, from 10 a.m. to 6 p.m. Come out and celebrate small with us! Plaza Palomino is located in Tucson at 2960 N Swan Road (at Fort Lowell Road). Flux Gallery is in Suite 136; Grey Dog, in Suite 138.